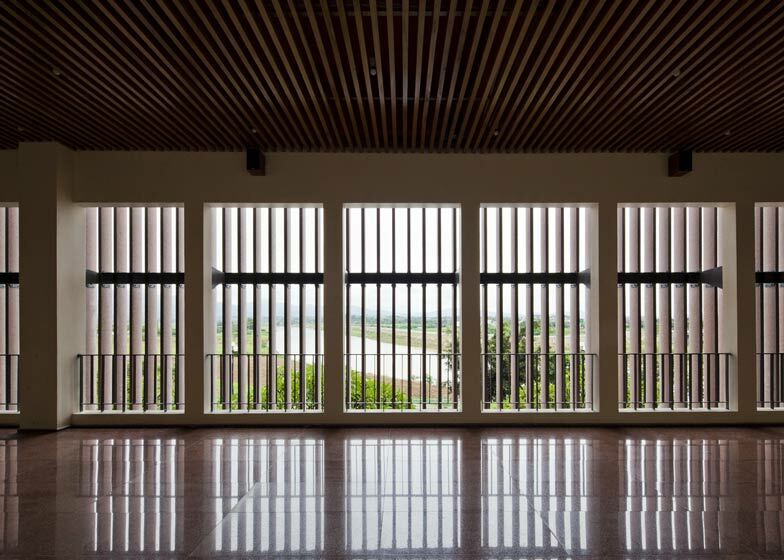 Weddings and parties take place inside halls framed by stone, timber and bamboo at this events building for a Vietnam hotel by Vietnamese firm Vo Trong Nghia Architects (+ slideshow). 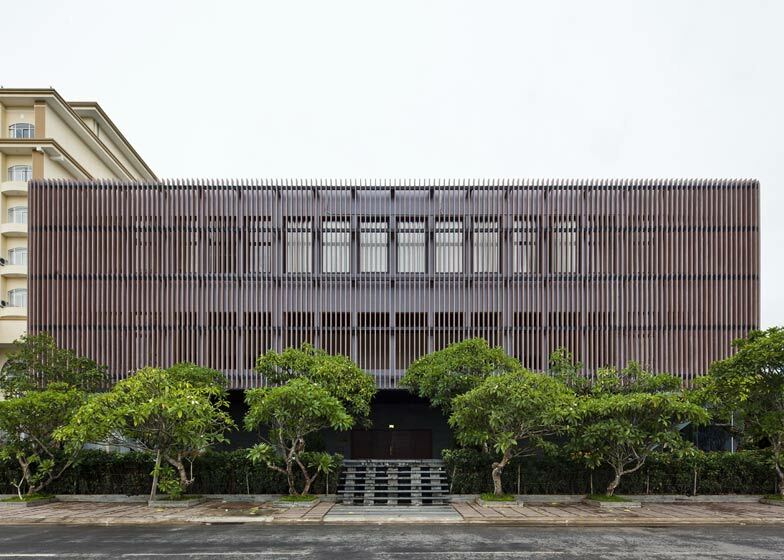 The Kontum Indochine Wedding Restaurant is the second building Vo Trong Nghia Architects has completed at the Kontum Indochine Hotel, following a bamboo cafe that is situated next door. There are three banquet halls contained inside the building - one on the ground floor that seats 800 guests and two on the first floor that each accommodate up to 400 people. 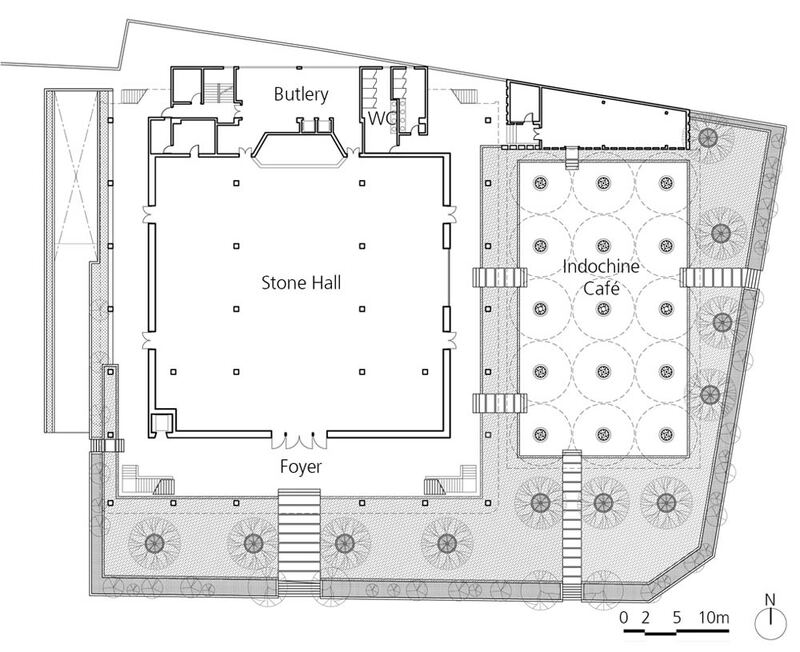 The largest space is known as the Stone Hall, as it surrounded by ridged walls made up of basalt stone slabs. Some of the slabs have been polished, while others have been either hammered or left raw. 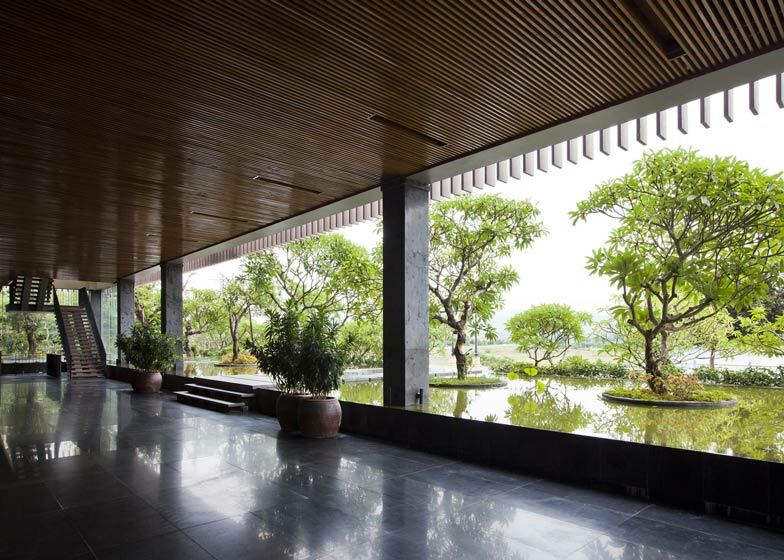 "These stone slabs have different surfaces, creating both dignified and delicate spatial characteristics, which are well suited to festive ceremonies," said the architects. 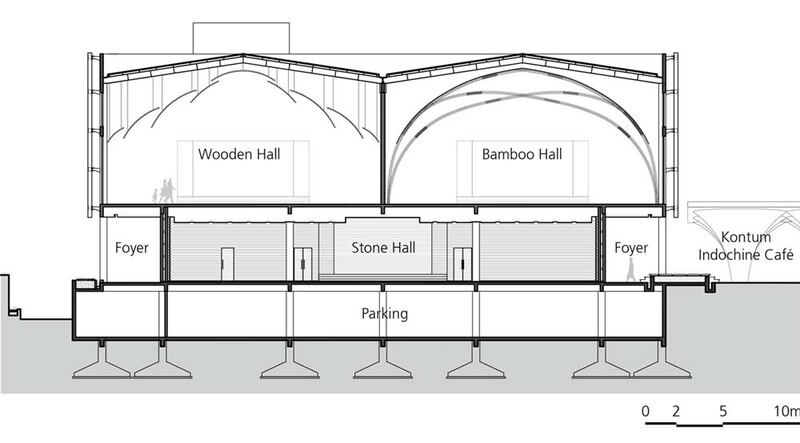 The other two halls are double-height spaces with vaulted ceilings, including one made from self-supporting bamboo frames and one comprising nine fan-shaped timber fins. A large foyer connects the three halls and leads up to offices on the second floor. A louvred facade made from locally quarried pink granite surrounds three of the building's elevations, helping to shade the interiors from direct sunlight. 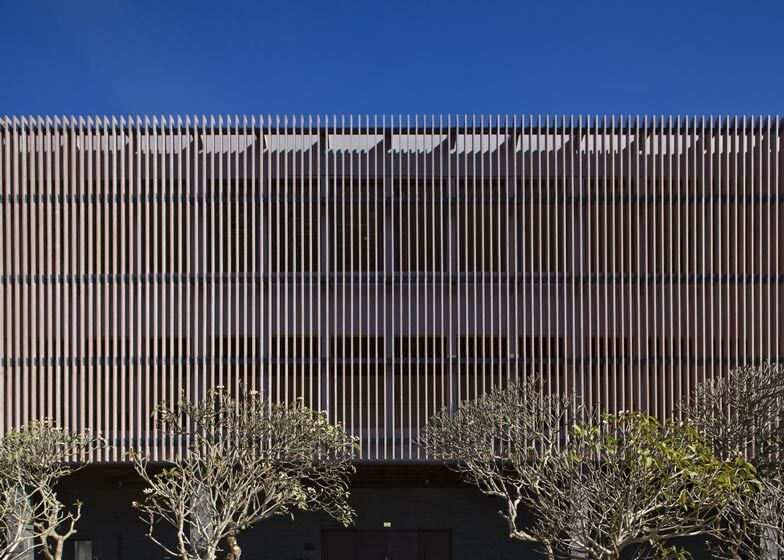 "The louvres blur the outline and details of the building, creating an abstract volume, well balanced with the surrounding landscape," added the studio. 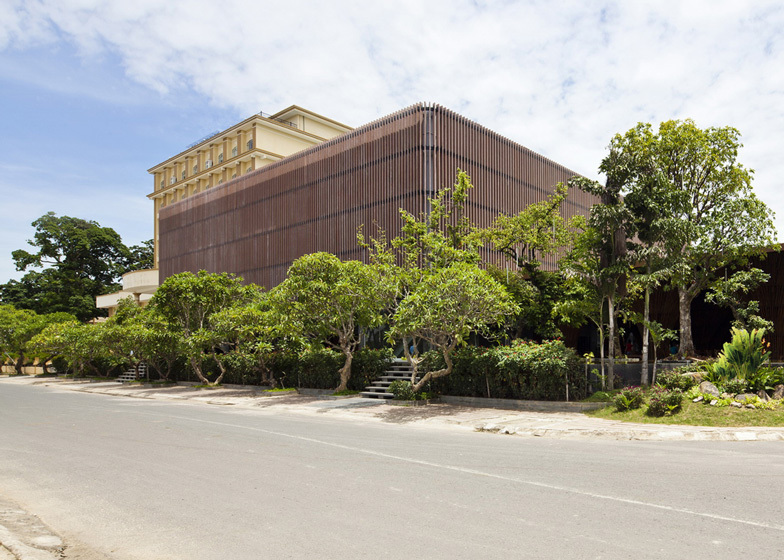 Vo Trong Nghia Architects completed the Kontum Indochine Cafe earlier this year. 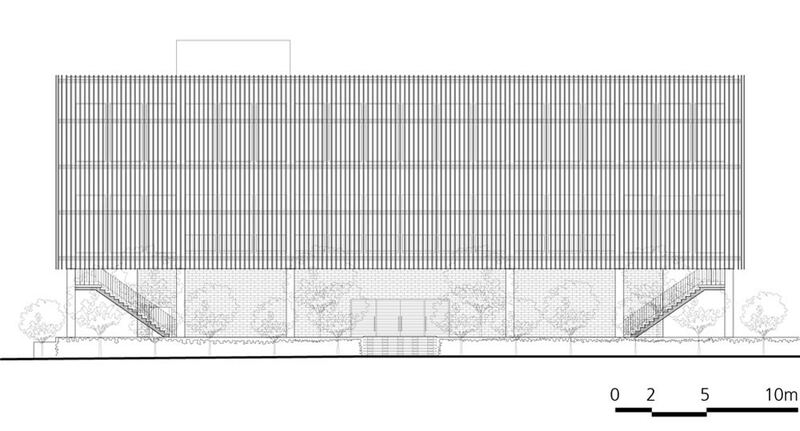 Other projects by the firm include a bamboo-framed conference centre and a school with open-air corridors. Kontum Indochine Wedding Restaurant is designed as a part of a hotel complex along the Dakbla River in Kontum City, Central Vietnam. 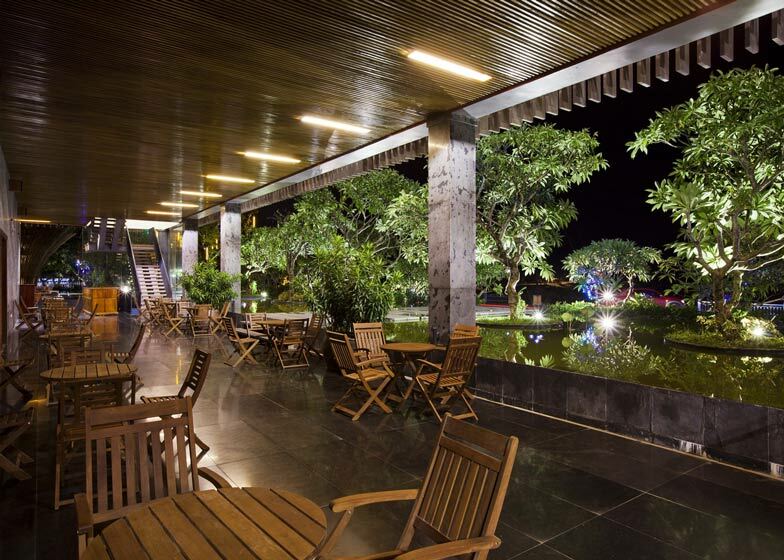 Adjacent to Dakbla Bridge, a gateway to Kontum City, the restaurant serves as a venue for wedding ceremonies, conferences and social activities of the hotel guests and citizens. 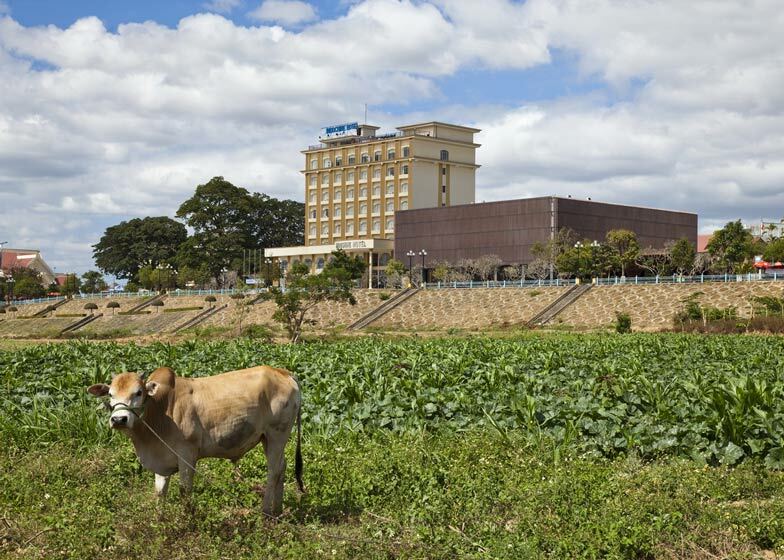 The 5500-square-metre building, which contains three banquet halls and office space over three storeys, is covered by louvres made of local pink granite stone, quarried in Binh Dinh Province, 150km away from the site. The louvres blur the outline and details of the building, creating an abstract volume, well balanced with the surrounding landscape. Two different finishes were applied to each louvre; its front surface was polished, creating a sparkling exterior when exposed to sunlight, while the two edges and back surface were framed to soften the light coming into the building. Visitors can enjoy the view of the river through the louvres in light pink, being protected from harsh tropical sunlight. The three banquet halls feature three different natural materials; stone, bamboo, and wood. 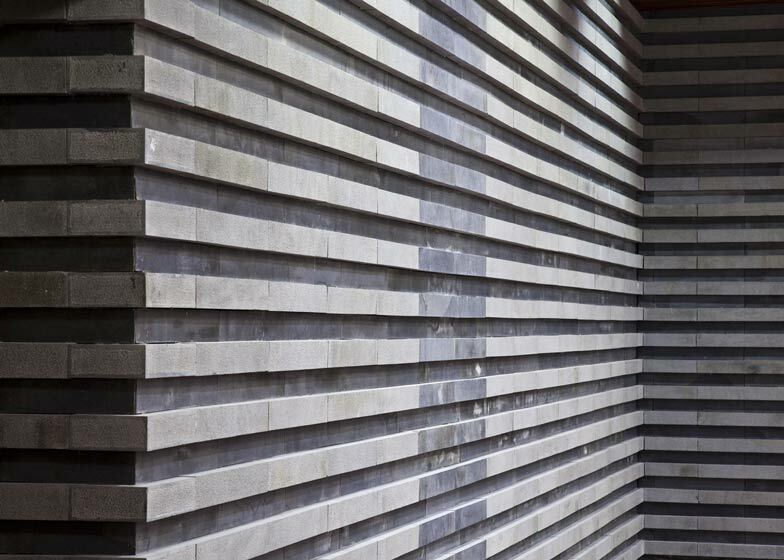 Walls and columns of the "Stone Hall", located on the ground floor and capable of 800 guests, are composed of Basalt stone slabs 120 deep, 80mm high and 595mm long. These stone slabs have different surfaces; pitch-faced, polished or hammered, creating both dignified and delicate spatial characteristics, which are well suited to festive ceremonies. 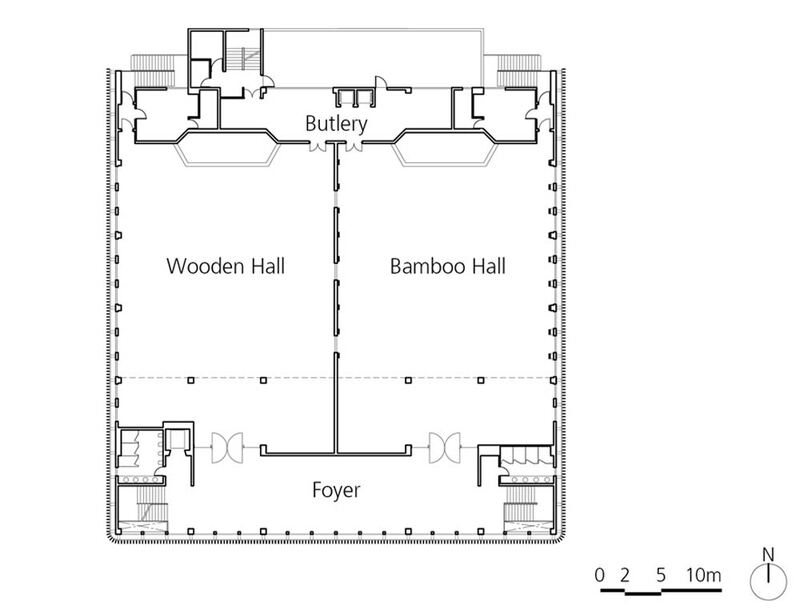 Both the "Bamboo Hall" and "Wooden Hall" are located on the second level, each having capacity for 400 guests. 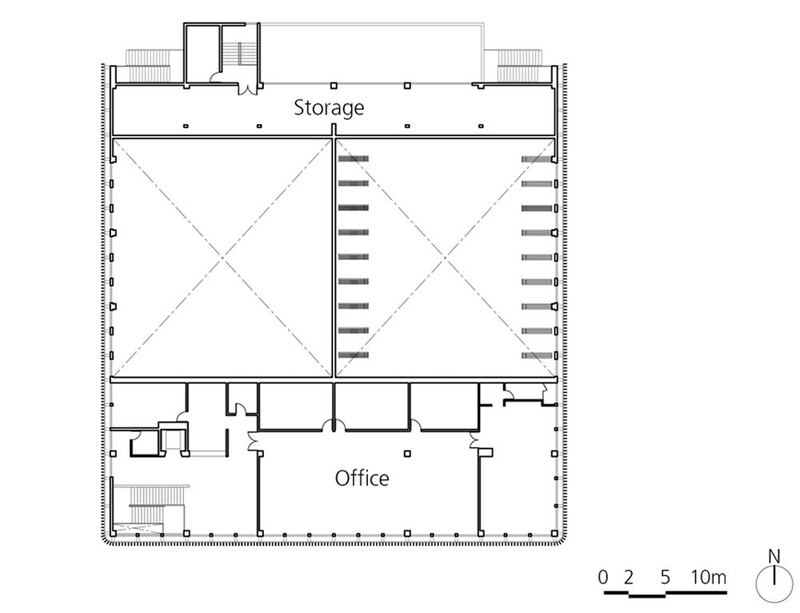 The materials vary between the two halls, giving different characteristics of each space. 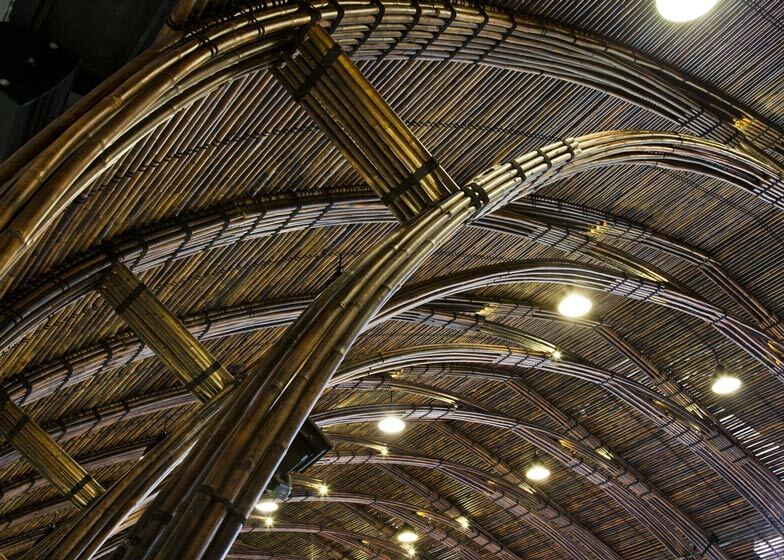 The "Bamboo Hall" is a ceremonial space composed of self-standing bamboo frames 6.5m high and spanning 18m. 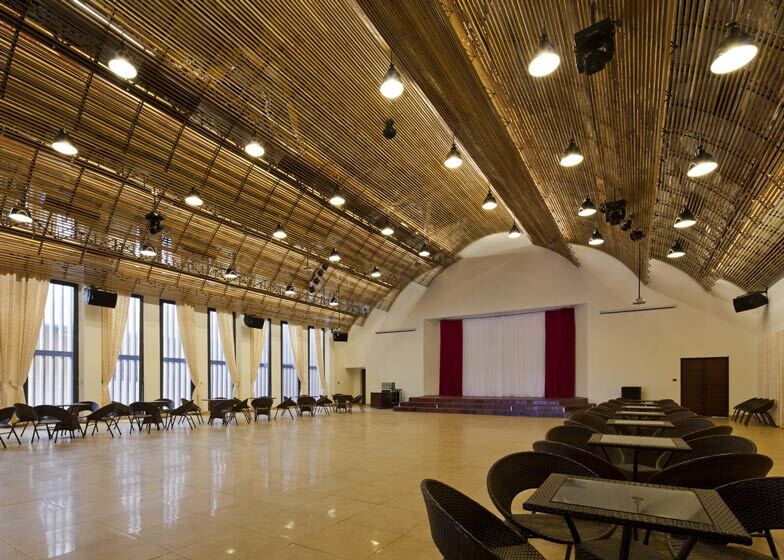 These bamboo frames are illuminated by the light fittings, hence the hall gives a quiet and intimate impression compared to the bamboo structure in the adjacent facility; "Indochine Café" which is a commodious open space. 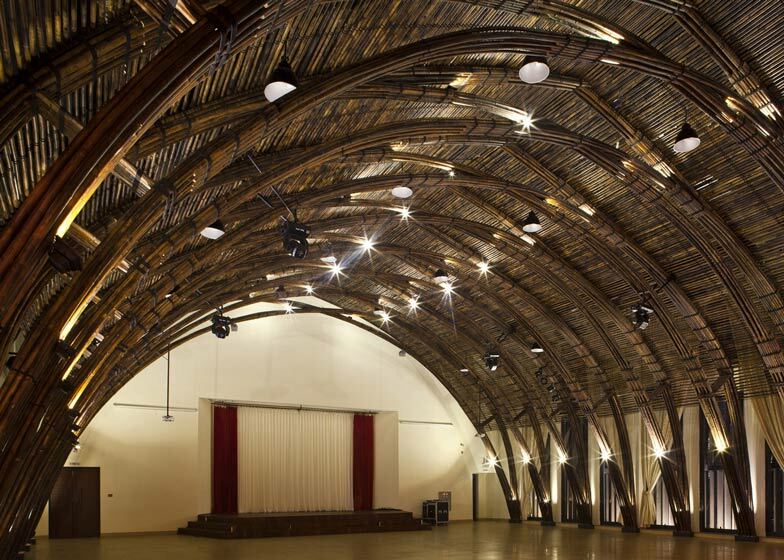 The "Wooden Hall" has a ceiling consisting of nine fan-shaped louvres. 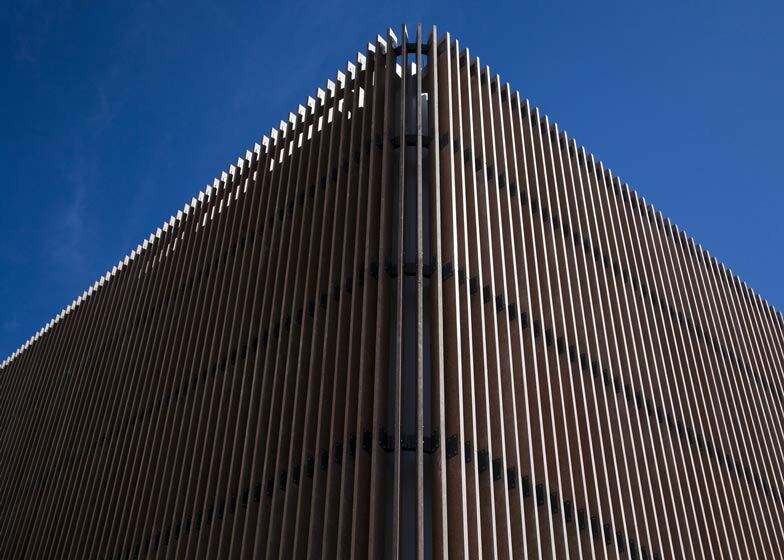 The louvres are made of 20mm x 50mm brightly coloured pieces of endemic timber locally called "Kate". The ceiling gently illuminates the interior functions similar to a light shade. Natural light and air pass through the pink stone louvres into the foyer, which lies in front of the two halls and is accessible from the staircase on both ends of the building.